You are here: Home / Dentistry / What Are Bite Guards? Orthodontic braces and retainers aren’t the only oral appliances which your dentist might fit you with. One of the more popular oral appliances is the bite guard. Also known as a teeth guard, dental guard, stress guard and night guard, this oral appliance protects your teeth from the effects of bruxism, or gnashing of teeth. This appliance is known as a night guard because teeth grinding episodes often occur while one is asleep. What does the treatment plan for bite guards involve? After evaluating your need to have bite guards, your dentist will take impressions of your upper and lower teeth. Your dentist will make use of dental impression putty in order to take accurate impressions, which will then be sent to a laboratory technician. The tech will then fabricate the bite guards by using the impressions as guides. Most bite guards are made of acrylic, and should fit your teeth snugly. It’s normal for your bite guard to feel uncomfortable inside your mouth for the first few days, but it’s crucial that your bite guard should not hurt. 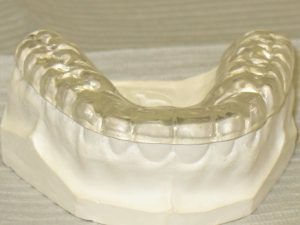 While bite guards are often prescribed by your dentist to be used while you are asleep, in extreme cases, you might have to wear these guards throughout the day as well. What can wearing a bite guard do for you? The primary advantage of using bite guards is that it protects your teeth from the friction which is generated by constant grinding or gnashing of your teeth. Bruxism is a dental condition wherein a person continually grinds his or her teeth during periods of anxiety, stress, and when unconscious. One of the common symptoms of bruxism is uneven teeth especially the two front teeth. But bite guards not only protect your teeth but also distributes the force generated when you grind your teeth on all of your teeth, not just the two front teeth. While there is no sure cure for bruxism, the change in your bite due to wearing the bite guard may actually send a signal to your brain. Your brain, in turn, would send another signal to your jaw muscles which will help to cease the grinding episodes. If your bruxism is triggered by stressful situations, such as when you are taking an exam, then you might want to ask your dentist about thinner bite guards which are made with a rubbery material, which won’t interfere when used during daytime.